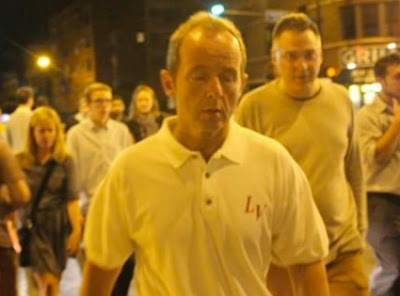 Last night, local alderman Tom Tunney stood up and walked out in the middle of our neighborhood's monthly community policing meeting, declaring its 45-minute length to be "a long one" as he headed toward the exit. Earlier in the meeting, 19th district community policing (CAPS) Sgt. Jason Clark announced changes to the community meeting format. No more questions about specific incidents, he said. No questions about manpower. And, next year, they're cutting the number of public meetings in half. What neither Tunney, Clark, nor anyone else in the audience knew is that yesterday's date—November 4—is sacred to CWB Chicago editors. And last night, for the first time in three years, a CWB editor attended the CAPS meeting. Given what transpired, we are more determined than ever to be the community's source for information that the city doesn't want to share voluntarily. Reporters often ask us why we started CWB Chicago. We've always given the same answer: We got tired of hearing misinformation and juked statistics at our local CAPS meeting. But we've never told anyone about the defining moment—the one thing that eventually pushed us from being disgruntled residents to reporters and writers. That moment came on November 4, 2011. Two days earlier, three of us were at the local CAPS meeting. It was held in the same room as last night's CAPS meeting. We sat there with about 15 other people, mostly Boystown bar employees, as the CAPS officer raced through his agenda, which failed to include the fact that robberies had been brought up as a "community concern" by the audience several months in a row. There was no mention of any crime patterns or problems from the police side. It was all over in 15 minutes. Two days later, on November 4, a mutual friend was severely beaten and robbed as he walked home from the Belmont Red Line station. He was coming home from work. 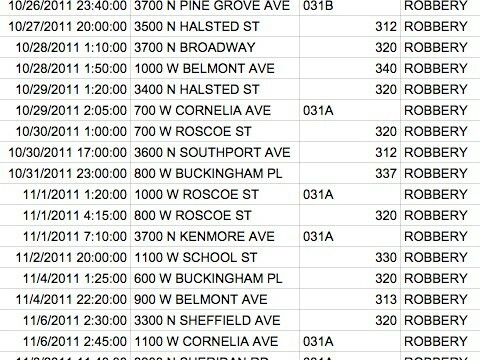 The October/November 2011 robbery spree is seen in city data. 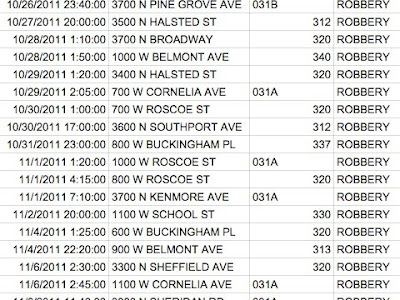 The final straw came a few days later as the city released crime data from the week before. But the officers made no mention of it. We already knew that they had shrugged off citizens' concerns for several months. But, with the release of stats, we knew that the CAPS officers were recklessly failing to even tell people about an obvious problem. All in the name of making it seem that "crime is down." We all knew that we would have to do something. It took a while to figure out what that something would be, but we got there. And last night's CAPS shenanigans re-doubled our commitments. So, it's supremely fitting that our alderman, who claims that public safety is his top priority, chose last night—the 4th anniversary of our buddy's brutal mugging—to stand up and walk out of a room full of concerned citizens. It's supremely fitting, too, that the CAPS sergeant would choose last night to tell the audience that the community would no longer be allowed to ask about specific crimes or to talk about manpower issues. Instead, the sergeant said, there will be safety tip-filled PowerPoint presentations. And, effective immediately, CAPS meetings will be held every other month instead of monthly. July will not be one of those months. So, any concerns you may have about post-Pride Parade crime will have to stew for six weeks until August. The "Back To School Safety" PowerPoint is scheduled for October—six weeks after the kids have returned to school. Speaking for those of us at CWB, the meeting succeeded in raising far more questions that the sergeant bargained for. Given our personal experiences, we'd say the best way for him to really fix the CAPS program would be to reduce the number of meetings to zero and to toss all of the cops in the CAPS office into patrol cars to work the beat. Permanently.